Fugong, the Nujiang Valley's second city. The westernmost valley in Yunnan’s ‘three-rivers’ precinct, the Nujiang River Valley remains difficult to access, comparably unaltered by modern Chinese development (though this is rapidly changing), and barely visited by foreigners. For centuries, its remote location has provided safe-haven for a plethora of ethnic minorities. 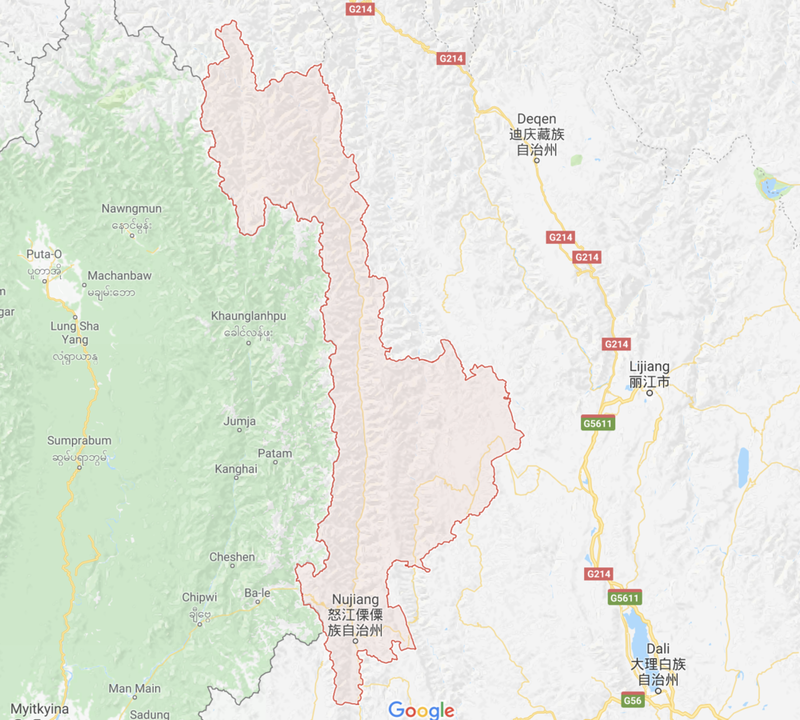 Nu, Lisu, Drugong, and Tibetans dominate the valley, though their historic foothold in the valley is now subject to the same Sinofication that is occurring throughout all of China’s furthest frontiers. And while roads are being built and the government is turning the valley into a new thoroughfare between Yunnan and Tibet, for now, it remains a 300 kilometer long dead-end road - for foreigners, anyway. My plan was to travel from Dali to Liuku - the provincial capital - before catching a series of local buses north to explore the Tibetan townships of Bingzhongluo and Dimaluo. Both Bingzhongluo and Dimaluo are just about as close as an independent traveller in China can get to Tibet: in fact, from the hills above Bingzhongluo, you can see Tibet, and from that distance, it looks very much the impenetrable kingdom. While I desperately wanted to pass through Tibet on this trip, being alone made it nearly impossible. Tibetan tourism is flourishing, but foreigners generally need to be grouped together: It’s expensive and catered, and the hand-held, over-supervised nature of travel I’d be subjected to there is just not what this trip is about. So the Nujiang Valley, I reasoned, with its unique brand of Tibetan and minority culture, its reputation for arduous travel, and its sheer isolation, would be just about the closest thing I could hope for while remaining well and truly independent. I'd soon realise any fantasy I had about the Nujiang being a final frontier - a bastion of minority culture in an increasingly homogenised China - was just that: a fantasy. Departing Dali early in the morning by coach, the journey begins uneventfully. But soon, the west-bound highways cuts through a dramatic scene. From the bus window, the valleys towards the Nujiang grow deeper, sheerer. The terrain on this far-south western frontier looks impenetrable. 4000-plus meter peaks are a constant. Only through the marvel of China’s rapid push towards modernity have the once isolated valleys and mountain communities been linked together. Gone are winding mountain passes and steep climbs. Instead, endless tunnels and bridges spanning thousand foot drops. The bus soon left the highway, cutting through winding roads and past isolated hill-towns, before the first glimpse of the raging Nujiang River Valley appeared. Six hours from Dali, the bus pulled into the entrance Nujiang Lisu Autonomous Province, and I'm subjected to a routine police check. The only foreigner on the bus from Dali, I'm forced to walk the length of the coach and disembark, accompanying the soldier to a small office where my passport details are entered manually, and a torrent of questions are lobbed my way in a stern, indecipherable slur. There's no malice or overt aggression. The soldiers are diligent, friendly (if not initially, certainly by the end of the exchange) and professional. When I explain through Google Translate that I'm just a tourist, the mood lightens. Like usual, my passport is handed around between soldiers - not to double-check my credentials, but to explore the stamps in my rapidly-filling document, a small window into a world perhaps they’ll never know. Tame the affair might be, it's illustrative of a constant in China: the monitoring of citizens’ and travellers' movements. All Chinese citizens are required to carry with them a trackable ID card, which is scanned and catalogued as they enter each province. There is no escape. Police board the buses, and there are checkpoints every hundred kilometers or so on the highway. It’s just something every Chinese citizen is forced to reconcile with: if you choose to move in your own country, the government will know your every step. Soon after surrendering my every detail to the authorities, Liuku - the capital city of the province - appears out of the ether. On first glimpse, it seems as if the entire city defying gravity. Hotels soar above the violent river torrent. Houses are etched into the hillside. New train infrastructure is being built into the mountains in an impossible feat of engineering - one that aims to soon link this remote corner of China to the chaos and crowds east of here. Liuku, a thriving city of 300,000, has a boom-town atmosphere. It’s a good representation of the rapid change occurring everywhere in China - there’s opportunity here. It’s evident in the cranes and construction vehicles that dominate every frame. But while Liuku’s natural setting was impressive, there’s little else to distinguish it from the endless concrete jungles that litter China. These cities all have the same soulless feel, same concrete aesthetic, and a feeling that any local culture has all but given way to the modernisation vision of China’s ambitious leaders. It’s entirely possible I am being naive - there’s no real way I could truly understand any one place passing through like I do. But the ubiquity - and the superficial banality - of China’s mid-sized cities makes them univiting. I could have stayed in Liuku. But the promise of something more raw pulled me further north. My bus continued up the valley to its final destination Fugong, the valley’s second city. Just 100 kilometers from Liuku, I was to get my first real taste of traveling by road through the Nujiang. From Liuku, the road was brutal, often terrifying, and completely clogged with traffic. It’s hard to describe the precarious nature of the roads in the Nujiang Valley, and my aisle seat and dwindling light on the way to Fugong made taking a worthy photo challenging. But to put it simply: every successful corner taken and every successful overtake feels like death has been cheated. The road is mud, the cliffs rise up to well over 100 meters. I saw numerous cars at the bottom of the valley; some semi-submerged in the volatile stream that cuts this valley in two. The pace was, thankfully, slow. But it pushed my journey into the dark of night. It would be a late arrival in Fugong. I stepped off the bus 11pm, 8 hours since Liuku, which felt just down the road. The city was asleep. And one of the major hassles in rural China is finding accommodation that actually accepts foreigners. I plodded off in the dark to a hotel at the edge of town: the only one I knew would accept me. Negotiating a price was impossible, and I was forced to pay over 200 yuan for a room - a rate about 8 times what I’d been accustomed to back in the cities. I settled in to a hotel room - my first for months - and luxuriated in its comforts - free towels, a hot shower, a tv - before sleeping. A market place in Fugong. Waking to the luxury of a $30 hotel room was unique: I could have stayed there all morning. But I had to press on. While public buses make it all the way to Fugong, that is effectively the end of the line. To keep heading north, I'd have to negotiate a ride with a mini-bus operator in the middle of town. Once of the challenges of doing so was, of course, communication. Usually in China, I would use Google Translate on my phone and show locals a visual translation. The challenge in the Nujiang is the diversity of languages, and a much lower literacy rate than in the rest of China. The primary languages in the valley are - for now - still Lisu and Tibetan, not Mandarin. While almost all residents will have a capacity to speak Mandarin, fewer know how to read and write it. My naivety about the ethnicities and languages in the valley also meant it was impossible to identify who spoke what tongue. So half the time, when flashing my translations, I was met with dumbfounded expressions. It was the most profound communication challenges I had had since leaving Australian soil. The nature of the Nujiang's geography, though, meant it's impossible to get lost. There is only one north-south road. I found my way onto a small, old minibus after stating Gongshan loudly. After waiting for a few hours for the bus to fill, we began the northward traverse of the valley towards Gongshan - the third major town in the Nujiang. The ride was typically onerous. The roads are barely built, with few guard rails protecting vehicles from plummeting into the river. The minibus was filled to the brim with people and goods and cigarette smoke. The roads were also extremely busy and delayed. The mammoth construction effort occuring through the valley has rendered much of the road one-way, creating delays that can last anyway from 5 minutes to 5 hours. Traffic jam on a paved section of the road between Fugong and Gongshan. The only joy on the trip to Gongshan was watching Jurassic Park II on the phone of the man sitting in front of me, who watched it only to see the action, fast forwarding all dialogue scenes and Sam Neil's Oscar-worthy innuendo. It was a 12 hour day to Gongshan. And just over 150 kilometers traveled. I found a gloriously cheap hotel - just 100 yuan - and went exploring the town as night fell. That night, I found a small Tibetan restaurant, and walked in. Immediately, a couple gestured at me to come over and join them at the table. Middle aged, the couple were from Urumqi. We struggled to converse - but the woman had a smattering of English phrases under her belt that she'd picked up during a holiday to New Zealand some years ago. We ate in silence. But it was good to have company. Dinner mates at a Tibetan restaurant in Gongshan.